-Lastly, a cold and snowy November was like a "slap in the face." 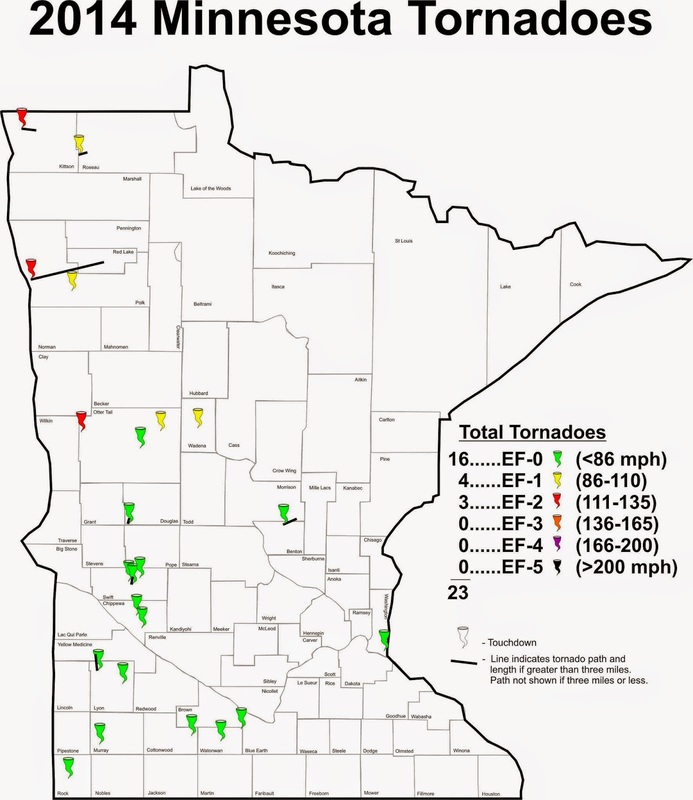 This week Todd Krause of the NOAA-National Weather Service in Chanhassen, MN provided a summary of tornado reports across the state this year. Only 23 tornadoes were reported in the state during 2014, the second consecutive year with a smaller than average number (only 15 reports in 2013). You can view historical data on tornadoes at the State Climatology Office web site to compare other years. Among the noteworthy characteristics of 2014: the majority of tornadoes (16) were rated EF-0 (winds<86 mph) and caused relatively little damage; an EF-2 tornado (winds 111-135 mph) was on the ground for nearly 38 miles across portions of Polk and Red Lake Counties on July 21st but shrouded in low clouds and heavy rain it was hard to detect; and two tornadoes occurred in Otter Tail County on September 4th between 4:48 am and 5:45 am, very unusual times for such storms to develop. Since last Friday (December 5th) temperatures have slowly been moderating and warming across the state. Nearly every observer has reported daytime highs above freezing and a few places have seen 40F or greater. The NOAA-CPC keeps emphasizing a warming trend across the country in their mid-range outlook products all the way out to December 24th, Christmas Eve. In fact there is hardly a place on the USA landscape expected to see cooler than normal temperatures over that interval. Therefore it is likely that a number of spots across Minnesota will lose their snow cover before Christmas. For those who dread a Brown Christmas there is hope that an Albert Clipper storm system out of the northwest is expected to deliver some precipitation over Christmas Eve and Christmas Day. Don't know yet how much. A recent paper in the Journal of Geography and Geology by Yuan and Mitchell documents a comprehensive study of climate trends in Minnesota. Some conclusions from this study: precipitation has increased significantly, especially in the months of May and June since 1985; minimum temperatures have increased significantly; and the length of the growing season has expanded, particularly with an earlier onset in the spring. A recent paper in Geophysical Research Letters by Indiana University researchers documents an increase in extreme temperatures at the "tails" of the spatial distribution on Earth. These increases are found to be larger than those associated with the central or mean Earth temperature values. In the past 30 years warm anomalies are increasing at a faster rate than cold anomalies. A new study by the United Kingdom Meteorological Office shows that the probability of having extremely hot summers in Western Europe has increased significantly. Extremely hot summers that once had a historical frequency of twice per century, are now expected to occur about twice per decade. What's has been the longest lasting snow storm in the Twin Cities area? It seems that most snowfall lasts for just a few hours up to a day in length. The longest duration of continuous falling snow was from shortly after midnight on December 6th to shortly after 5 pm on December 9th, 1969, a period of 88 hours! This was very light snow, amounting to a total of only 14.0 inches, but the December total snowfall that year was 33.2 inches, an all-time record for the Twin Cities until 33.6 inches fell in December of 2010. Heavier and more memorable snow storms were not as long-lasting. For example, the Halloween Blizzard of 1991 (over 28 inches of snowfall) occurred over a period of 67 hours, while the Armistice Day Blizzard of 1940 (nearly 17 inches of snowfall) lasted about 55 hours. The average MSP high temperature for this date is 28 degrees F (plus or minus 12 degrees F standard deviation), while the average low is 12 degrees F (plus or minus 13 degrees F standard deviation). MSP weather records for this date include: highest daily maximum temperature of 53 degrees F in 1883 and 1968; lowest daily maximum temperature of -1 degrees F in 2000; lowest daily minimum temperature is -15 degrees F in 1879; highest daily minimum temperature of 37 F in 1928; record precipitation of 0.61 inches 1886; and record snowfall is 4.6 inches in 1941. Average dew point for December 12th is 9 degrees F, with a maximum of 49 degrees F in 1968 and a minimum of -19 degrees F in 1962. The state record high temperature for this date is 64 degrees F at Tracy (Lyon County) in 1913. The state record low temperature for this date is -39 degrees F at International Falls (Koochiching County) in 1995. State record precipitation for this date is 3.66 inches at Caledonia (Houston County) in 1899; and the state record snowfall for this date is 18.0 inches at Altura (Winona County) in 2010. December 12, 1913 was the warmest in state history, with nearly all parts of the state seeing afternoon temperatures that reached 50 F or greater. Some western and southern communities reported record values in the 60s F.
December 12, 1995 was the coldest statewide in history, with every spot in the state reporting sub-zero F temperature readings. Several northern cities reported -30 F or colder, and the temperature never rose above -15 F at Itasca State Park. Abundant snow cover blanketed the state. December 11-12, 2010 brought heavy snow and a blizzard to many parts of the state. The Twin Cities received over 17 inches, and the Metrodome roof collapsed under the weight of the snow. The Holidazzle parade on Nicollet Mall was cancelled and the MSP Airport was closed for a time. Blizzard warnings prevailed across southern Minnesota, where Winona reported 23 inches, Lake City 21 inches, Red Wing 20 inches, and Owatonna 14 inches. Mild temperatures over the weekend with increasing cloudiness and a chance for rain or drizzle on Sunday. Chance for rain or snow later on Monday and into Tuesday with temperatures returning to near normal levels. Warmer again toward the end of next week.